According to Turtle Bay‘s Bristol teams, sweet and sour will be the “in” flavour combination in 2017. So, combining this trend with the fact that Halloween is just around the corner, Turtle Bay Bristol manager Chris Nash-Jones has created a creepy Caribbean cocktail that’s perfect for those planning on throwing a party to mark the occasion this year. 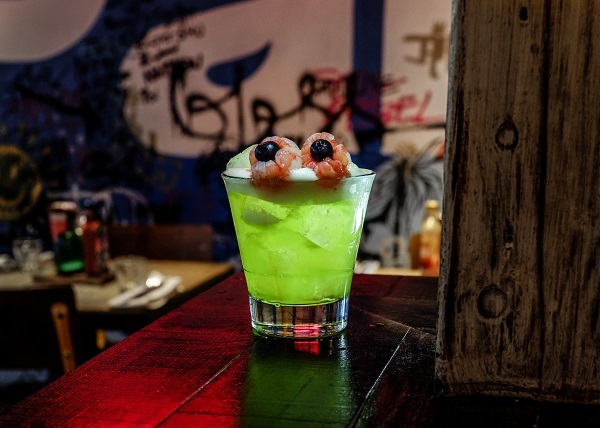 The bright green “Eye See You Baby” is a Midori sour with a Caribbean twist: the traditional whisky has been replaced with dark Jamaican rum, while the superfood-based eyeballs adorning the glass give it a suitably creepy feel. Pour a little grenadine into the hole that you’ll find in the centre of the lychees, then stick the blueberries into the hole. Add the midori, sour mix to the glass and give a quick stir. Top with a dash of Sprite.